The protesters accuse Mr Thaksin of corruption and human rights abuse. Thousands of opponents of Thai Prime Minister Thaksin Shinawatra are holding a protest in Bangkok, vowing to stay in the streets until he steps down. About 50,000 people marched to Mr Thaksin's office waving Thai flags and shouting anti-government slogans. Police said the march was peaceful. This is the latest in a series of rallies accusing Mr Thaksin of corruption and abuse of power. He has called a snap election in April in an attempt to win back authority. One of Mr Thaksin's most prominent opponents, Sondhi Limthongkul, told the crowd: "We will rally around the clock until Thaksin and (his wife) Pojaman leave the country." Another protest leader, Suriyasai Katasila, said: "The rally will go on and we won't stop unless we win." 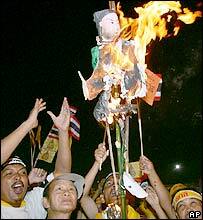 The rally included the burning of Mr Thaksin in a mock funeral to cries of "Thaksin out! Thaksin out!" On Sunday afternoon, the protesters marched from Sanam Luang (Royal Field) to the Democracy Monument, which commemorates the end of absolute monarchy. In the evening, rally organisers called on the crowd to march towards the prime minister's office. Waving flags and accompanied by a van playing music the crowd made its way there. The BBC's Simon Montlake in Bangkok says there were tense moments as protest leaders negotiated their way past police lines. Critics of Mr Thaksin say he has destroyed democratic institutions and is guilty of corruption, tax evasion and human rights violations. Mr Thaksin, who has said he will resign if his party does not win at least 50% of the vote in the election, is campaigning in the north-east. He has strong support in the countryside, where the majority of Thais live. About 100,000 supporters rallied on Friday to support him. Mr Thaksin warned ahead of Sunday's rally the authorities would not tolerate violence. "Protest leaders must be cautious and make good plans to control the mob. If violence or chaos occurs, state authorities will take legal action against anyone who violates the law," he said. 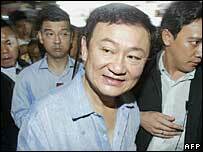 Mr Thaksin dissolved parliament on 24 February after about a month of street protests. But his attempt to regain the initiative has been thrown into doubt by the main opposition Democrat Party and two other parties, which have said they will boycott the election. Analysts say this would seriously threaten their legitimacy.